Contact Protocols on the Marae now! Assemble at the entrance at the Waharoa, the name was given by late Parai Wi Repa in memory of all the past and present men and women that have contributed countless hours of mahi since the dreams and visions of the marae which began in the 1960s. The Kawa of Wainuiomata Marae is called Paeke; this is relevant to the speaking order of the male speeches or Whaikorero. The Tangata Whenua start the speeches, it is then handed over to the Manuhiri for all their speakers to complete. When the last speaker on the manuhiri side has laid down the koha, the mauri returns to the Tangata Whenua to give the final speech. Gather your entire group at the Marae Entrance. Please make sure everyone is dressed appropriately. Wahine – no shorts, short skirts etc. The Kaikaranga of the Marae (Caller) will begin to call you onto the Marae. Your Caller will respond and will begin to lead you towards the Wharenui (Meeting House). If you do not have a Caller, then proceed forward as a group, silently. The second hau kāinga karanga acknowledges those that has passed on beyond the veil (you will pause briefly in front the the wharenui in acknowledgement) Once the third karanga of the tangata whenua is given, you may proceed to entering in to the Wharenui. Once you’re inside the Wharenui you should sit on the right hand side with your male speakers at the front. It is customary to support each speaker on your Paepae with a song at the conclusion of their speech – can be just a verse. Supported by other group members. Koha (a tikanga of the powhiri ceremony) is given by the manuhiri to the Marae. This is an unconditional gift or donation that is given in recognition of the Manaakitanga (hosting) by the home people. The koha is laid down after the last speaker from the manuhiri side and picked up by a male from the Haukāinga side. If you wish to gift a Koha, your last speaker will present the koha. It is important not to confuse the koha with the charges of the Marae and should be treated separately. Is the pressing of noses, (sharing of the breath). This takes place after the whaikorero or speeches are completed. The Tangata Whenua remains in place whilst the Manuhiri (your group) proceed in a procession past them – greeting with hongi, kiss, shaking of hands. When Powhiri is held inside the Wharenui, it is the Kawa of Wainuiomata Marae that the women enter the whare first (ladies before gentlemen). This is a less formal process for welcoming manuhiri on to the Marae. The Kaumatua or a Representative from the Marae will advise if this process is more appropriate for your occasion. The Kaiwhakanoa concludes the powhiri process and brings this ceremony from tapu (sacred) to noa (ordinary) and is done through the consumption of drink and/or food. This then allows for the visitors to be free from restriction on the Marae. The Mihimihi process is the introduction of ourselves to each other. This takes place inside the wharenui either before the Kaiwhakanoa or after (you will be guided by a Kaumatua or Marae Representative). 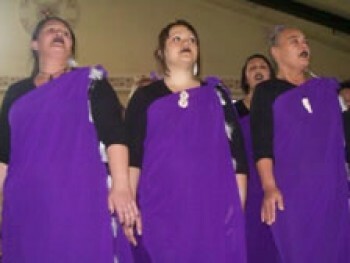 The poroporoaki takes place before each roopu takes it departure from the Marae or during the final kai (or Hakari). A time is usually arranged with the Kaumatua or Representative of the Marae as to when and where this will take place.